It’s official… I’m flying out to be a guest on the Ellen DeGeneres Show next week. Back in April of 2006 when a producer on the show originally contacted our office, I asked for your suggestions on experiments to do with Ellen. Lots of people suggested my Smoke Rings demo and Ellen might have taken your suggestion (hint, hint). Let’s just say that our office was filled with lots of smoke today as someone practiced shooting cups off of everyone’s head. We’re told that the air date will be next Friday, September 21, 2007. More to come. Carnival of Education: It's So Much Better When You Can TOUCH Things! Scientist of the Week - Great Idea! I am so psyched that you are going to get to do this! Last time I saw your funtabulous experiments personally was in a summer class I took with you about 5 years ago. I truly hope you drag out the trash can. It’s so classy you know. It could tie in with smoke somehow, I just know it. (hint, also)Have a bast. Perhaps literally. Second grade teacher in CO. I hope you do the exploding bubbles on Ellen. I saw you speak at the National Science Teachers Association a few years ago and I know that Ellen will have so much fun with you. I always wondered why you hadn’t been on David Letterman yet or Jay Leno. Just know that a whole bunch of teachers will be watching you from Missouri. I read the comments from your post in 2006 and I agree that you should do the trash can trick. I attended the Hands-On Science Institute at Regis University years ago and I remember when you produced your son out of the trash can. Too funny. Good luck on Ellen. I can’t wait to see you on Ellen. Smoke rings are the first thing that came to my mind…go for it. I think the potato launcher is a great one too. I vote for the wind tubes too…my son always has me come to his class to blow up a tube and I’m famous with his classmates each year. Thanks to you I get to be “Sergei’s cool mom”. 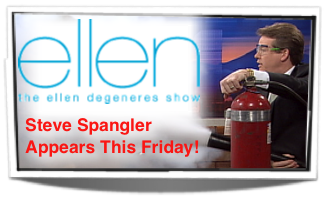 Have a blast on the Ellen show….maybe this will be the first of many visits. You help us all to have a blast with our students! The smoke rings are awesome! I think the mentos is a great experiment (especially if SHE holds the diet coke!). All of us teachers look forward to seeing you on friday. Steve, we’re looking forward to seeing you have a blast on “Ellen” (ha, ha). Seriously, we at Mad Science of Central Iowa have really enjoyed doing the vortex generator for kids around here, messing up hair, blowing out candles, shooting smoke rings, etc. My favorite part is when we actually explain the science behind it! Oh yeah, the Bernoulli’s Paperwork experiment with the leaf blower and the toilet paper is also one of my audience’s favorites. Of course, they really react when I tell em not to eat it because it’s been recycled! Anyway, hope it was a lot of fun! Steve, I have personally been involved with the trash can smoke rings, at the NAFCC conference in CA 2 years ago, and I think Ellen would LOVE that one! She will never expect the BLAST that can knock the cup off your head! You and Ellen together, what were the producers thinking?! Have fun! Hey Steve! Way to go! I knew you way back when… Jack was in my preschool class at ELC on Broadway! And the twins were on the way. You asked my class to “test” a new bubble solution. experiment you do will WOW Ellen and her audience. I hope you do include something with squiddy, as that is always my students favorite. They also talk for weeks about the swirling milk and food coloring, adding a touch of soap, of course. There are a bunch of us in Eaton that will be watching you and cheering you on Friday!! Congratulations! I saw the “clip” this AM, I am at work an unable to see the full show and have no means of taping or viewing in other way. I was on her show in 2003 via a remote hook-up, never had the honor/privilege of meeting her in person. The segment I saw on 9news this AM was fantastic and have no doubt the entire segment was great! Promoting science cant be done enough…in my opinion. Congratulations! Job well done! I watched you on the Ellen show. I have never heard of you but now I am on your website looking for things to show my 12 year old son. You were terrific and i am hoping to have that much fun when I show my son some of your science tricks or experiments. Its nice to see someone having fun at what they do and I personally enjoyed watching and i am 43. We are on our way to town to pick up diet coke, mentos, a new shower curtain to replace the old one we will be using, bungee cords, and buckets or trash cans!!!! Great way to have family time on my only Friday evening off. I’ll be stalking your site from now on! Great job on Ellen today!! Loved the smoke rings that knocked the cups of the heads of the people in the audience. My husband and I said this would be fun with the grandkids/family/friends as we have alot of outdoor parties. Please let us know what we need. Loved the demonstrations on Ellen! Very impressive. Just have a quick question. What smoke machine did you use and where can I get one? Can I get the instructions for the smoke rings thing? I saw just the end of it and don’t know how to attach the shower curtain to the bucket so that it is secure. I love this and want to create it for my 13 grandchildren. Amazing. Yeah I want the intructions to the smoke ring experiment too. As from what I observed, it’s plastic stretched tight around the rim of the trash can, tied with, I guess “string”? But I would really appreciate the exact materials needed. This would be great to shoot at all those trick or treaters this year. I plan on using my fog machine. Will that be a good alternative then a smoke machine? Please post the experients steps!! Ditto to question from JoAnn Ayres. How do you secure the shower curtain to the bucket or trash can for the smoke ring experiment? I too have grandchildren (boys) who would LOVE this! A Look Inside Our Lab on Modern Marvels Preparing for Ellen… What to do?